Customer feedback is gradually becoming the cornerstone of growth initiatives. A new research published in the Harvard Business Review found that the act of just asking for customer feedback in itself is enough to help keep customers satisfied and coming back for more — even when they do not respond to your request. Several theories of consumer psychology point to the fact that even a simple satisfaction survey appeals to your customers’ desire to be coddled, reinforcing the positive feelings they might already have about your product, and making them more likely to buy from you. The very process of asking questions or seeking opinions induces people to form judgments that otherwise wouldn’t occur to them. They might not consciously realize that they love a feature unless you seek feedback about it. Customer feedback has become one of the primary drivers for long term growth. Present day organizations jump at every opportunity to talk to the customer or learn about them. Businesses are spending millions of dollars on setting up feedback channels: emails, reviews, surveys, website analytics. The pertinent question now is: how do you utilize these channels to actually learn from the feedback? Before you establish the viability of a channel, it is crucial to develop a clear picture of WHY you are collecting feedback. Are you seeking first-hand advice on product improvement? Are you building a new feature for which you’re seeking the users’ inputs? Have you been receiving a lot of complaints? Once you have the end goal clear, proceed to the tactical part: how do you collect feedback? There is no one-size-fits-all tactic to gain information from your users. Different situations require different methods of collecting customer feedback. For example, a survey form sent to an already disgruntled user will only make matters worse; a phone call works better here. 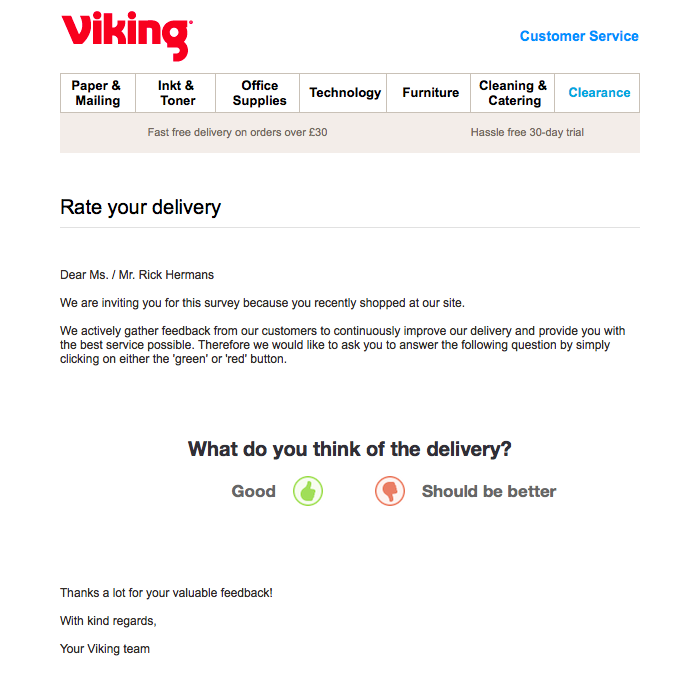 There are hundreds of ways to collect feedback from customers. The ones we’ll talk about here are the most popular — they are the most effective too. These most common way of collecting customer feedback are survey forms with a set of questions that are usually sent in an email. The one thing you have to always keep in mind here is to not get carried away and ask too many questions. QuickTapSurvey states that the connection between the number of questions and the time spent answering each question is not linear. The more questions your survey has, the less time your respondents spend, on an average, answering each. It is clear from the above table that the longer the survey, the less time will the respondents spend on each question. The takeaway is to make the survey as short as possible. There is, however, no ‘ideal’ length for a survey. A few experts do say that anything between 5 and 10 questions is a decent number. To keep your surveys short, a good rule of thumb to keep in mind is: only ask questions that fulfill your end goal. Ensure that every question serves a clear purpose. If you do not intend to use the information, do not ask that question. The aim is to collect customer feedback and not to have them write an essay. For example: If you are surveying a customer who has just exited your paid plan, there is no point asking them if the onboarding was easy! Your only aim should be to understand why they are leaving and what can you do to prevent that. It is also important to start with open-ended questions. Let your customers surprise you. Multiple choice questions will give you answers based on your own assumptions. If you really want to know what the customer is thinking, give them an open-ended question. A great open-ended question is: What do you love the most about the product. It is also a great hook to have your respondents start the survey on a positive note. The best place to use this is when we want detailed inputs and have some open-ended questions to ask. 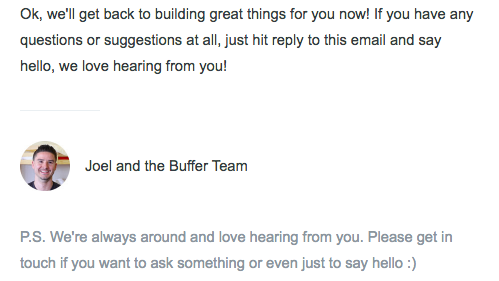 This should only be sent to an engaged user, who you’re sure would like to take the time to provide feedback to you. One way we used this in Hiver was to understand from our users which integrations we should build. We asked customers open-ended questions about how they use Hiver. Then asked them which integration they’d like to see, which was an MCQ, followed by another open-ended question about how they’d like to put the integration to use. Customers are constantly thinking of ways your product can work better for them. Maybe parts of your app do not have what they are looking for, or maybe the design could look a little better, or maybe they found something that is broken. More often than not, they will not reach out to you on your support address. That happens only when the problem is big. But for the minor lapses, your users will just give up and walk away slightly frustrated. A great idea is to offer a survey while your customer is using your app. The survey can be prompted the moment a user has finished interacting with a particular feature in the app. Since the user is already in the process of using that feature, it is very likely that their feedback will be very precise and to the point, and not ambiguous. Remember: Your users are on the app for a certain purpose, it is not a great idea to throw a long survey at them. Keep it to two to three questions that are relevant to the page that it’s being displayed on. Intercom.io is a fantastic tool to trigger in-app surveys in your app. For example, the moment a user finishes using a particular feature, a quick question like the one below is a great way to get their ideas about improving it. When you want a quick feedback from someone who has performed a certain action. Timing is of the essence here — you have to trigger the survey at the very moment a transaction ends. The questions should be specific to what the user is using or has just used, and NOT about the product in general. It’s said that if you truly want to understand someone, you will have to talk to them. The surveys and tests will give you tons of data but they can never tell you what a person truly feels about your product. This is when you need to reach out to your users through the phone. It is a personalized and proactive method that generates the best responses. Hearing a person’s voice and tone is the best way to sense what they actually feel about your product. A call will help you tell the features that get users excited, features that really make their lives easier. The key here is that the person calling the user should genuinely want to understand their problem and offer solutions. Do not do it because you have to do it. Do it because you care. This is not a sales call. The second factor to keep in mind is the time when you call. Studies have shown that customers are more likely to respond between 8 am and 9 am, and between 4 pm and 5 pm. Lunchtime, between 1 pm and 2 pm is the absolute worst time to reach out to anyone. Scheduling calls with your users, talking to them, and making sense of feedback which is not as structured as entries in a form is a lot of hard work. The key here is to focus on the users who can give you the best feedback to improve your product or service. It makes sense to do phone calls only with the users who are avid users, have deep knowledge about the area you operate in and can give you actionable feedback. This is not a good avenue when you want to reach out to a lot of people at the same time. Transactional emails are the ones that you receive right after signing up for a new service, or upgrading to a new plan, and so on. Basically, these are emails triggered by a certain interaction between the user and your app. More often than not, transactional emails are treated like a necessary notice and companies would not put much effort in creating a dialogue with the customer. These emails often lack the aesthetic appeal of the website and the newsletters and deliver an inconsistent customer experience — that’s a shame. Contrary to this popular practice, transactional emails can be used as a powerful weapon to foster a dialogue with customers. If we look at email open rates, these emails do better than all other emails, says an Experian report. The reason is that people actually want to receive these emails — for instance, they want to know if an upgrade went through or not. Asking the right feedback question in these emails will certainly get good responses. Interestingly, the peak-end rule states that ‘our memory of past experience does not correspond to an average level of positive or negative feelings but to the most extreme point and the end of the episode’. Say a user receives a transactional email just after they’ve upgraded — asking a question at that juncture would evoke positive feelings about the product and set them on the path to loyalty. When a user does something significant: signs up, upgrades to or exits a plan, and so on. You can send them a quick one-liner question or a short multiple choice question. The key is to gain an insight at the right time without burdening them with too many questions. It’s the simplest question you can ask your customers: ‘’how likely are you to recommend us to a friend or colleague?’’ It is, basically, a method to measure your customers’ sentiment about your product. Let’s take an example. Say there are 100 respondents. The worst score you can get is -100 and the best score you can get is +100. Apple uses NPS surveys to find detractors and improve their retail store experience. 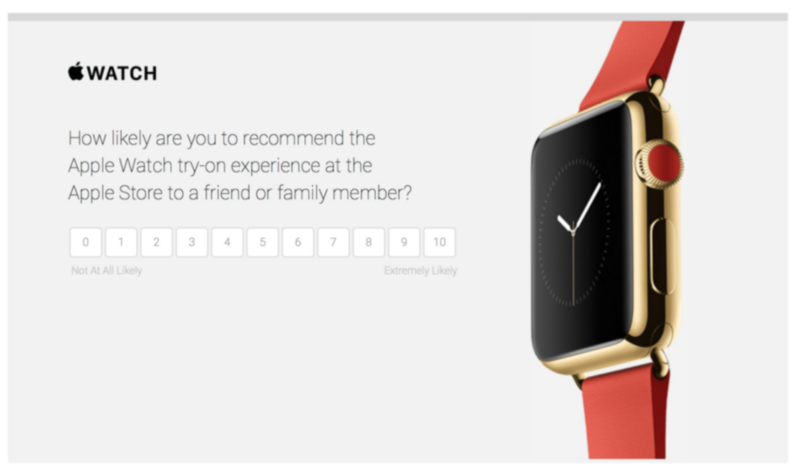 Whether a customer made a purchase or scheduled an appointment to try on an Apple Watch, they e-mail a survey to rate the in-store experience. Remember: Any score above zero is good, anything above +50 is excellent, and over +70 is considered world-class. The greatest advantage of NPS is its simplicity and ease of use. It can be set up in minutes and is easily understood by everyone in the organization. It also makes it very easy to compare yourself with the industry standards. When you want to understand the general sentiment of your users about a transaction. You can use NPS for any of the touchpoints that the customer might have with a team: sales, customer support, etc. For example, it is a good practice to send an NPS survey after a support query is resolved. 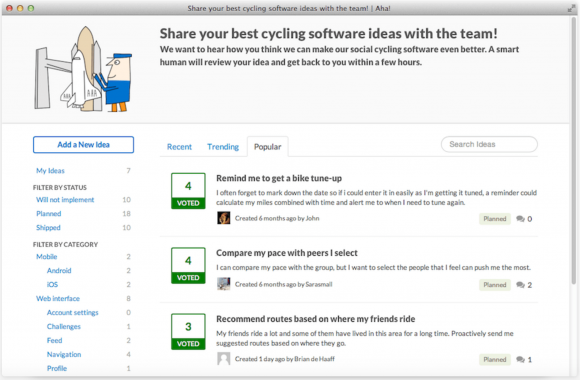 Suggestion boards take collecting feedback a notch up: it allows users to collaborate on ideas with not just the company, but also with other users. These boards allow users to create feedback posts which can be upvoted or commented by other users. Top posts that have been upvoted or highly commented can help you discover what the majority of your users need. The best thing about suggestion boards is that ideas that had been suggested by some customers became popular ideas among others who hadn’t thought of the benefits those ideas could bring. Aha.io is a wonderful tool for creating these boards. It is important to make the board very easy to navigate. Users should be able to add new posts with ease. Creating categories, allowing your customers to view the most popular ideas, and making it searchable are key. Results will take some time to develop. Feedback will not be accumulated immediately. Wait till your users leave enough feedback so that you can determine which ones are popular to your entire base as a whole. When you are looking for new ideas from your users. You should start with inviting the extensive users first — they know your product well and will be in a better position to suggest improvements or new features. After you have a few ideas on the board, you can start inviting more users — they can upvote or comment others’ ideas even if they do not have one. Once you’ve collected the feedback you want to pay attention to, the next step is to analyze the data and take actual steps to make things better for all stakeholders. “Every day, companies solicit feedback from customers, yet only a few translate that feedback into meaning. An even smaller fraction of companies actually take action or close the loop with the customer, to let them know their voice was heard,” says Whitney Wood, managing partner of the Phelon Group. 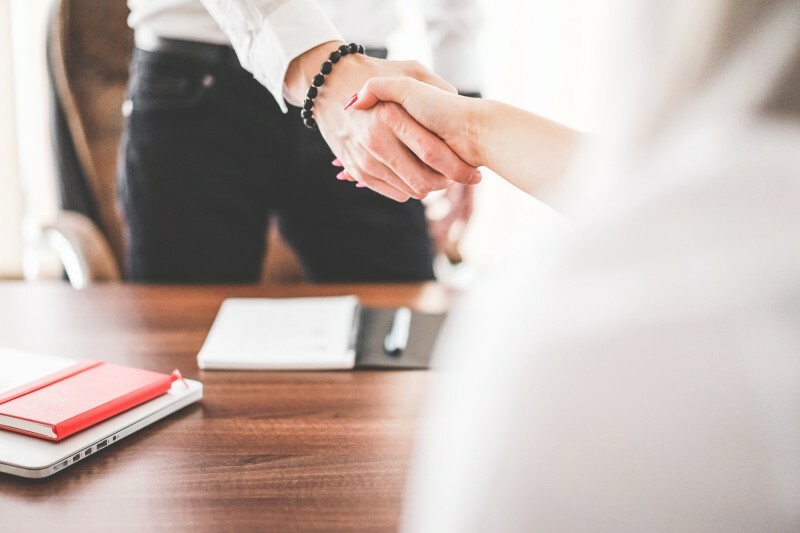 If you handle it right, the dialogue between you and your customers can become the biggest growth driver for your business. The only way to reward your vocal and consultative customers is to roll with the punches and bring in actual changes. More often than not, your loyal users would have developed an expertise of your product features; some of our users understand the product as much as our product managers do. The standup product improvement meetings can only take you so far — the real insight comes from the ones who use your product regularly. No matter how hard you try to empathize with them and put yourself in their shoes, your users will always have some exciting ideas that you did not think of. So, stop brainstorming and start following the advice your customers give you. Not only will your customers appreciate your willingness to listen and implement their ideas, but you will set yourself apart from your competitors, as a business that genuinely cares. LEGO Ideas is quite possibly one of the best examples of how customer insight can be used for product development. Enthusiasts can easily submit their own designs on this mini site. The projects gathering more than 10,000 votes from the community undergo LEGO review and are turned into new sets if the review is favorable. Nobody understands the pain points of the product as well as the customers. If companies are able to incorporate customer feedback into the product roadmap successfully, they have certainly come very close to the ideal market-fit. It is crucial to classify feedback into improvements and game changers. Let’s take a couple of examples from Hiver itself. A few of our customers thought shared labels can have different colors as that would help them manage their inboxes better. Now, this is a product improvement — we added it to our ‘task manager’ and had implemented in almost no time! After we built the shared mailbox, a few customers suggested we implement automation that will allow emails to be assigned based on a few pre-set conditions. Now, this is a game changer as it would significantly reduce the time people spend on task assignment. We added it to our ‘brainstorming session’ and discussed the pros and cons of doing it. It took us a few weeks to build it, but it’s been worth it. The biggest challenge is to get your customers to suggest. Would they really bother to spend time suggesting a feature? Fitbit implemented the suggestion boards and noticed that even the ones who did not have a suggestion were either upvoting and downvoting. Ideas suggested by other customers became popular among others who hadn’t thought of benefits those ideas could bring. Most companies are not a hundred percent sure about the verticals they should focus on. It is never an exact science and companies end up spending huge amounts on trial and experimentation. Customer feedback can be a good way to find out where you belong. 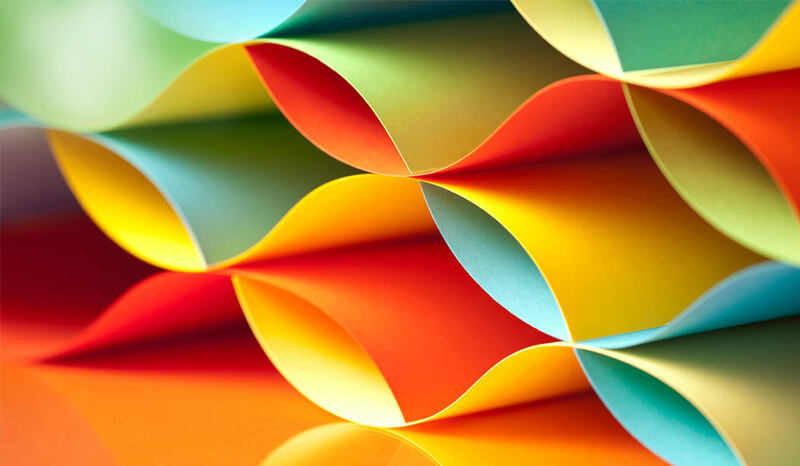 During the process of analyzing feedback from customers from a broad spectrum of verticals, you will begin to see patterns as to where do the majority of your happy customers come from. Once you have discovered the verticals where the majority of your happy customers exist, start working on strengthening the relations you already have with them. Strive to make them your advocates and seek recommendations. Are you stuck with the principle that negative feedback should be swept under the rug and kept silent? It is a clear indication that you have set your customer success goal to a low ‘simply meeting customer expectations’. It is crucial to use feedback to improve customer service. A customer who has taken the effort to call you is a lot more likely to tell their friend about the same problem — ignoring the negative feedback will have a compounding effect. Contrary to what most businesses think, a negative feedback is an opportunity to prevent customer churn and foster a long-term relationship with the customer. These are the guys who’d need a little extra work: call them, understand their problem and ensure you do your best to make them happy. Ensure that you check on them regularly — make them feel ‘cared’. Showing that you care goes a long way in building a healthy business relationship. By keeping the two-way conversation open and building trust gradually, you can turn these problem customers into raging evangelists. Remember: they have taken the time out to give you a feedback when they could have just switched to another product. Any feedback is a display of interest in your product. Be wise and use feedback to improve customer service. Customer satisfaction is the primary indicator of how happy they are with your product. 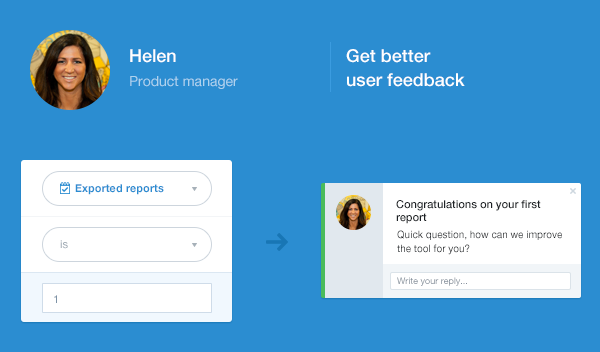 Gathering feedback will help you quickly identify the happiest of your users. The next step is to nurture them into advocates. Get them sufficiently excited to rave about your product and recommend it to friends and colleagues. Monetary rewards do not motivate advocates. Do simple things — thank you notes is a great idea. 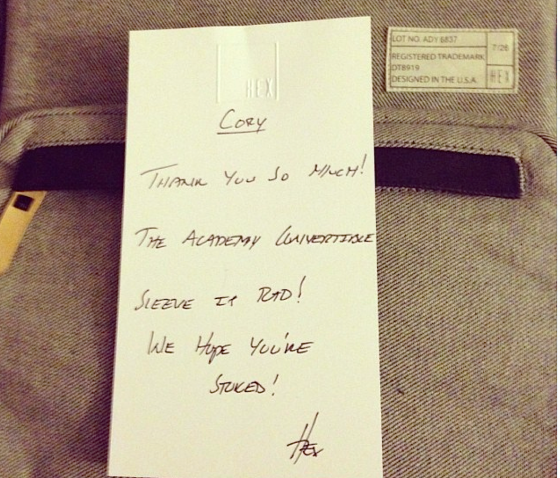 HEX is one cool company that attributes a lot of their success to the handwritten notes they send to their customers. Here are some great ideas to turn your customers into advocates. Imagine the world where most of your new customers came from business referrals. This can be achieved only when you know who your advocates are. Customer feedback can act as a secret driver to motivate employees. Say you’ve been hearing praise about a feature — pass compliments directly to the person who built the feature, and ensure the team knows it too. It is a good way to encourage healthy competition among your team members. Say you’ve been getting some brickbats about a certain feature — pass it to the person who built the feature and let them talk to the irate customer directly. It makes them feel in charge of that feature and they will be ready to take more ownership in the future. Share conversations that are interesting and come up with new ideas about the product (improvements or game changers) with the whole team. It would help everyone understand the larger picture. A startling truth about most SaaS companies: your support team always understands more about what the customer needs than your product team. It is time you start discussing your product roadmap with the support team as well — they are the ones who know about the ‘actual’ problems your customers face. Building a good product and marketing it well is the job only half done. A lasting commitment to evangelizing a customer-centric culture, followed by a fierce commitment to gathering, analyzing, and sharing the feedback across the company plays a vital role in propelling your product and the business forward. Always go back to your users and tell them you implemented something they suggested — this is a solid step in building a long term relation with them. Originally published by Niraj Ranjan Rout at hiverhq.com on April 5, 2017.